ESA's Euclid telescope will occupy a fixed orbit opposite earth from the sun - Lagrange point L2. 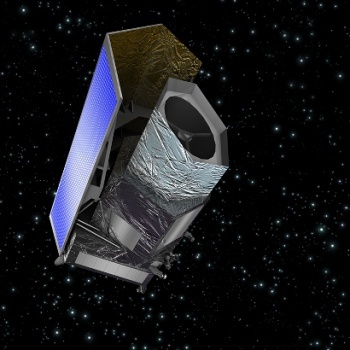 NASA has announced that it will be formalizing its partnership with the European Space Agency (ESA) on the Euclid mission, launching a space telescope designed to investigate dark matter and dark energy. Euclid telescope will launch in 2020 and be active for six years, mapping the locations of the more than 2 billion galaxies that populate the universe. In studying where galaxies are, including how they're shaped, the scientists hope to understand what effect dark matter and dark energy have had on the universe. Alvaro GimÃ©nez, ESA's Director of Science and Robotic Exploration, said "ESA's Euclid mission is designed to probe one of the most fundamental questions in modern cosmology, and we welcome NASA's contribution to this important endeavor, the most recent in a long history of cooperation in a space science between our two agencies." Dark matter makes up about 85% of the universe, but very little is understood about it. The rest of the universe is matter, what people, stars, and planets are made of. Dark matter is called dark because it does not interact with light, and while it was first postulated in 1932, it has never been directly detected. The only known way it interacts with regular matter is through gravity, acting as a binder that attaches galaxies to each other. Dark energy, meanwhile, seems to be pushing the universe apart, and dominates the mass to energy ratio of the universe. Less is known about dark energy than dark matter. A NASA official called dark matter and energy "one of the greatest science mysteries of our time." NASA's primary contribution will be state-of-the-art infrared detectors, one of the two scientific instruments planned for the Euclid. NASA has also contributed the time and efforts of 54 scientists to the Euclid Consortium, an international body of over 1,000 scientists who will analyze the data and manage the operations of the satellites.